This pattern shows English species suggested by the imaginary species in Dr Suess's The Lorax. It is organised in an ogee pattern, made of ribbons. They are reminiscent of the double helix of the DNA that determines how we all turn out, every living thing, and of chain link fences, and breaking through them to get out into nature. 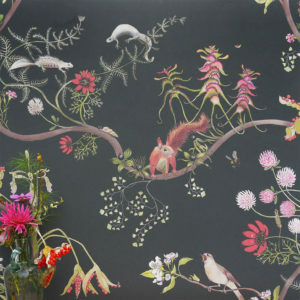 The humming fish are represented by great crested newts, the precious truffula trees are clover flowers whilst the playful barballoots are the red squirrels. The bees which also feature in a companion print are short-haired bumblebees – a wonderful conservation success story as they were extinct in the UK but acres of flower-rich meadows were planted in Kent, the bees were reintroduced and now buzz about with other rare bees benefitting from this rich habitat. Other flowers include several species of clover, Pheasant’s eye, crested cowheat, Stinking iris, whorled millifoil, Carthusian pinks, Herb Paris, wintergreen and blossoms of a rare old English breed a apple. Great great grandfather snail is the lagoon spire snail (thought extinct, but recently found in Chichester harbour). 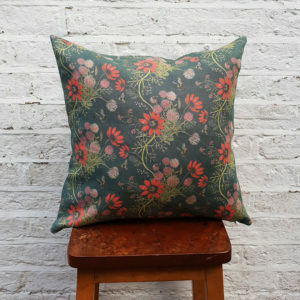 Companion prints include Mercia Ribbons and Mercia Bees, featuring details from this larger scale design. This pattern shows English species suggested by the imaginary species in Dr Suess's The Lorax. It is organised in an ogee pattern, made of ribbons. They are reminiscent of the double helix of the DNA that determines how we all turn out, every living thing, and of chain link fences, and breaking through them to get out into nature. The humming fish are represented by great crested newts, the precious truffula trees are clover flowers whilst the playful barballoots are the red squirrels. The bees which also feature in a companion print are short-haired bumblebees – a wonderful conservation success story as they were extinct in the UK but acres of flower-rich meadows were planted in Kent, the bees were reintroduced and are now thriving. Other flowers include several species of clover, Pheasant’s eye, crested cowheat, Stinking iris, whorled millifoil, Carthusian pinks, Herb Paris, wintergreen and blossoms of a rare old English breed a apple. 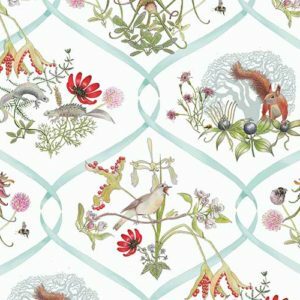 Great great grandfather snail is the lagoon spire snail (thought extinct, but recently found in Chichester harbour) Companion prints include Mercia Vines and Mercia Bees, featuring details from this larger scale design. 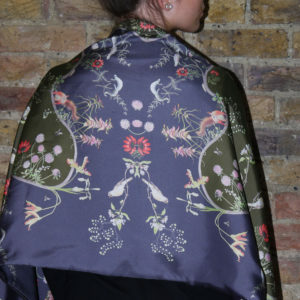 The English Mercia collection is Susy Paisley's tribute to one of the greatest conservation parables ever written, The Lorax by Dr Seuss. The species in the design are based on real world English equivalents of the imaginary species that feature in the Lorax story – inhabiting the region of the ancient kingdom of Mercia. 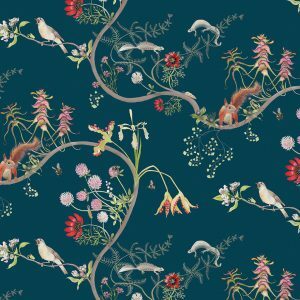 The humming fish are represented by great crested newts, the precious truffula trees are clover flowers whilst the playful barballoots are the red squirrels. The bees which also feature in a companion print are short-haired bumblebees – a wonderful conservation success story as they were extinct in the UK but acres of flower-rich meadows were planted in Kent, the bees were reintroduced and are now thriving. Other flowers include several species of clover, Pheasant’s eye. crested cowwheat, Stinking iris, whorled millifoil, Carthusian pinks, Herb Paris, wintergreen and blossoms of a rare old English breed a apple. 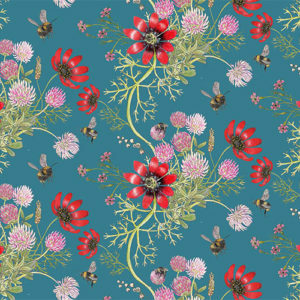 Companion prints include Mercia Ribbons and Mercia bees, featuring details from this larger scale design.